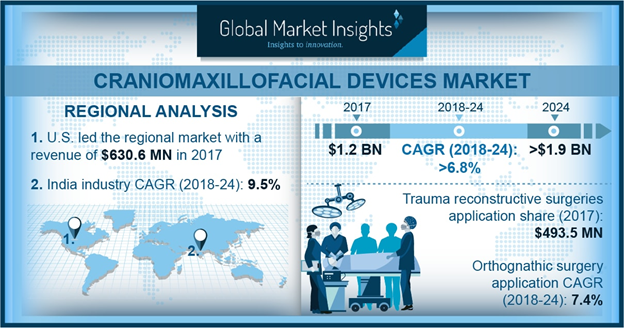 Global Craniomaxillofacial Devices Market size is set to exceed USD 1.9 billion by 2024; according to a new research study published by Global Market Insights, Inc. Recent technological advancements pertaining to the design of craniomaxillofacial devices that make it risk-free, less invasive and more efficient causing minimal damage to the bones will lead to growing demand and adoption rate of the device. Enhancement in the devices and implantation procedures has resulted in reduced health risk and increased the survival rate in patients. Hence, the rapid technological advancements will be one of the major factors responsible for boosting the craniomaxillofacial devices market growth in the near future. Lack of awareness regarding the craniomaxillofacial surgeries and treatments among the people living in the developing nations will be a market impeding factor. People with congenital facial anomalies in developing nations are unaware about the recent technological advancements regarding craniomaxillofacial surgeries and treatments, thus hindering the market growth. CMF distraction system market was valued around USD 92.9 million in the year 2017. CMF distraction system are lengthening device used for bone stabilizing and correction of post-traumatic defects or congenital deficiencies of the mandibular body and ramus, that requires gradual bone distraction. The CMF distraction system is used single time only, resulting in repetitive use, thereby boosting the business growth in the forthcoming years. Internal craniomaxillofacial device fixators market is estimated to grow at a CAGR of 6.7% over the projection period. Several advantages offered by the internal fixators such as accurate, and consistent performance with tightening fasteners will boost the product demand. Increase in number of midfacial and craniofacial skeleton that is affected by trauma, or facial reconstruction will enhance the industry growth in the forthcoming years. Bioabsorbable craniomaxillofacial devices market was valued around USD 303.7 million in the year 2017. Recent technological advancements and launch of new techniques such as use of bioabsorbable implant for fixing craniomaxillofacial injuries are some of the few aspects that will be responsible for the growth of bioabsorbable craniomaxillofacial devices market in the future. The application of craniomaxillofacial devices in trauma reconstructive surgeries is projected to grow at a considerable CAGR of 6.6% over the forecast timeframe. Growing treatment of orbital and mid-facial fractures, and peri-orbital soft tissue injuries will result in boosting demand and adoption rate of craniomaxillofacial devices thereby, fueling the market growth in the forthcoming years. U.S. craniomaxillofacial devices market is estimated to grow at robust CAGR of 5.8% during the projection period. Increase in number of traffic accidents, traumatic and sport injuries along with recent technological advancements in the country and high healthcare expenditure will result in promoting the growth of craniomaxillofacial devices growth in the U.S.
Germany dominated the Europe craniomaxillofacial devices market and was valued around USD 57.0 million in the year 2017. Growing number of facial injuries due to traumatic injuries, traffic accidents and sport injuries leading to broken facial bones has resulted in increase in demand and adoption rate of craniomaxillofacial devices in Germany, fueling the market growth in coming years.